Are you tired of super-complicated technology? Are you planning a long hike, or a camping trip, and are concerned about losing your expensive gadgets? Well, if that's the case, this AM/FM radio is just the solution. ...just the two of you and the radio playing "your song"
Maybe a transistor radio seems like an object that belongs to the Stone Age, but it has gained increasing popularity in the past months. Acknowledging that advanced technology has its limits and often enough has its backlash, you need an alternative. Operating only on two AA batteries, found in every household, and any store, this pocket radio will play for weeks. Standing on a stable base, it can fill up a room with a clear sound, as it has a built-in speaker. Having a sleek and chick look, it is small enough to fit in your hand, pocket shirt or pants pocket. It has fewer buttons than any other modern device, yet includes everything you need: on/off volume button, mono earphone jack, telescoping antenna and a carrying strap for convenience. Surprise your loved one and purchase your classic transistor today. This gadget cuts through generations, pleasing a technologically obsessed youngster as well as a nostalgic old-school dude. We are committed to providing you excellence and satisfaction. If you are not happy with our product, we will refund 100% of your money. TAKE A BREATHER FROM TECHNOLOGY -In this digital era, you're surrounded by your smartphone, iPad or laptop, leaving you with no breathing space and no peace of mind. But sometimes all you need is to lay back with a simple transistor radio, like in the old days. With this AM/FM Portable Pocket Radio, you can unwind by tuning into your favorite music station, with zero distractions, and no annoying touch screens with endless options. Authentic pleasure in real time. POWER OUTAGE, TRANSISTOR OUTRAGE - When power interruptions occur for long periods of time, batteries of all gadgets eventually die. It's a very stressful feeling of isolation. 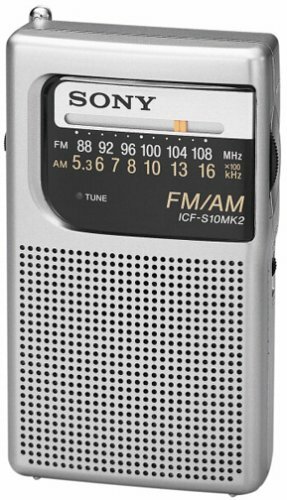 But with this AM/FM transistor radio, which runs on AA batteries found in every household, you can stay connected and get broadcast news in real time. Keep one in your emergency kit, it'll come in handy. FEELS GOOD, SOUNDS BETTER - In an age of ever evolving digital electronics, it's nice to know some things never change. Radio broadcasts rock even today. This AM/FM pocket radio will take you back to your younger years without compromising sound quality. With a built-in large speaker, it can easily fill a room with your treasured songs, or favorite baseball game. LONG LASTING ENJOYMENT-Using your devices throughout the day eats up batteries in a few hours' time. With our AM/FM radio, your AA batteries will last for weeks. So go ahead and take it on a long trip, or give it to your son or daughter for camp. You will get great feedback upon their return. TIMELESS GIFT IDEA - Want to score some compliments when choosing a present for your parents, grandparents, aunts or uncles? This AM/FM radio is the ultimate gadget to purchase. Simple to use, yet elegant and classy, it's sure to fill their heart with joy. Compact Size (4.7 L x 0.8 W x 2.9H )inches easy to fit your pocket , perfect for sporting events, camping trip , walking/hiking , fishing trips, and other on-the-go uses. With the hand strap , conveniently to carry while walking without lost . Build in high performance speaker , enhance your listen experience . Without complicate operations , this portable radio feature very easy to set . Slide the power switch and LED tuning indicator light up to refer tuning status . Powered by 2 AA batteries , which are included . Long lasting it's life . Cordless and no electricity needed , top choice for backup radio for emergency use like typhoon season or earthquake . 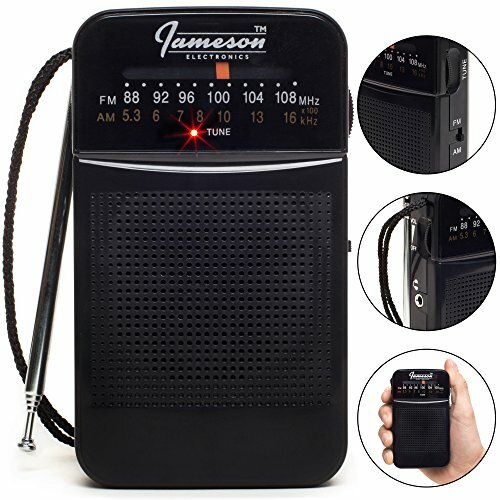 Compact Portable AM/FM Radio: Small pocket radio ( 4.7" x 0.8" x 2.9") that fits easily in your pocket , backpack or suitcase . Great for indoor daily news reporter or outdoor activity partner like walking / hiking as well as on travel . Come with AM and FM bands , lots of choice for radio fans . Built-in Loudspeaker And Earphone Jack : Built in high performance large speaker ensure a clear and loud sound, it can easily fill a room through your favorite radio stations . With the 3.5mm earphone jack , you are free to own some private space to enjoy the radios without disturbing others whatever at home or on walking , running . Best Reception : Unlike wire antenna , the telescopic antenna will catch a better signal without much static . Enhance your listening experience , telescopic antenna can be extended to 14 inches( max) for better reception in weak signal place . Battery Operated : Powered by 2 AA batteries , which are included . Technically to say , battery powered transistor radio has less jam so as to have better reception . Highly recommend to keep one for emergency radio special in hurricane season . Simple To Use : Power on the radio and ready to go, tuning in your favorite stations and adjust to your desire volume by the volume control , have a good rest ! . No complicate technical things . Great for senior ,elder person on the top of gift ideal for parents . 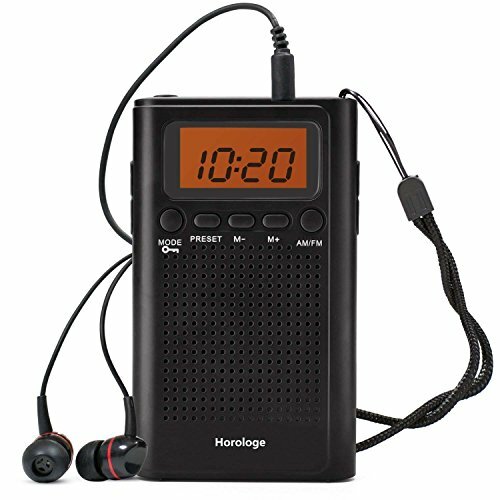 The Horologe AM FM Pocket Radio packs a powerful punch of sound in a convenient handheld device. Tune in to your favorite sports talk show or game broadcast, NPR, news program or your favorite local station music wherever you want to listen to it. When connect to the 3.5mm earphone jack, you can turn on the stereo mode for high quality sound. Battery-operated convenience and full stereo sound provide an enjoyable listening experience anywhere, anytime. 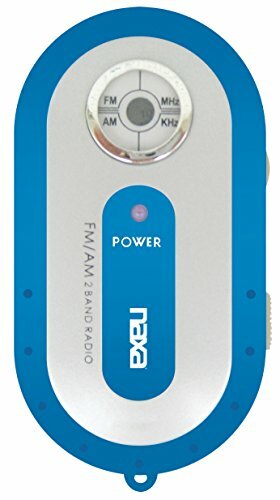 -Band AM FM radio, easily into shirt or jacket pocket. Power by 2*AAA battery(not included), you can also supply power by a DC 3V adapter (not included) . 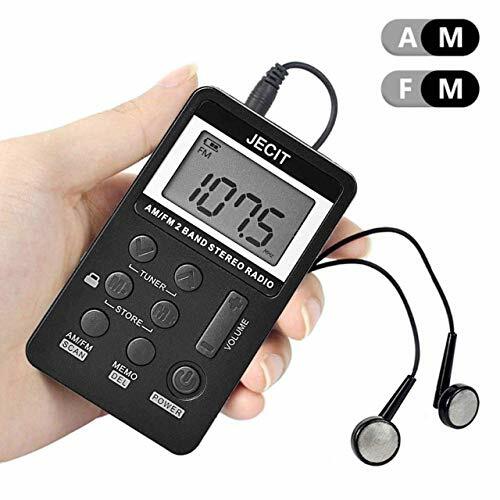 Digital Tuning and Display: With the digital LCD screen and the tuner, you can easily to know AM/FM channels you are listening to and adjust the frequency quickly. The first transistor radio hit the market just in time for the 1954 Christmas gift-giving season. While the inner workings remain relatively unchanged, this timeless piece of technology has become smaller and more attractive over the years. Long-Lasting and Durable - Many people keep their radios for decades because radio technology doesn't change. There are no software updates or hardware upgrades to keep up with. Nostalgic Feeling - There's something about listening to a radio. It's like taking a step back in time. Perfect for taking to the beach, on your next hike, camping trip, or family vacation. Pack away in your emergency/natural disaster kit to stay connected during troubling times. Catch the big game or NASCAR race while working in the garage or backyard. Have a cell phone-free family night and listen to your favorite music together. Listen to your favorite talk radio or news show, while being productive at work. LIGHTWEIGHT-COMPACT-SLIM-HANDY: Weighs just under 5 oz and measures a mere 2.6 in by 4.6 in. Small-sized and handheld for when space is at a premium but you need large sound. Makes walking, camping outdoors, and backpack travel nice and relaxing. SHOP with CONFIDENCE: This device is covered against defect by a strong 12-Month replacement warranty, similar to what you'd expect when buying from brands like Sony or Panasonic. Simply follow the directions at the bottom of your user manual. There are somethings always can make good memories, put a radio around while reading, listen to soft music, enjoy a quiet evening. Take ZesGood radio to journey, countryside, seaside, jungle, it can become your friends. 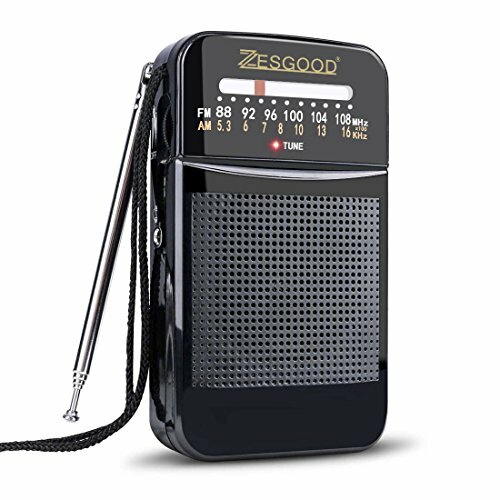 ZesgGood AM/FM Battery Operated Radio, We Mind Your Need! 1, tiny and portable, design with lanyard. 3, built-in speaker, sound clear and soft. 4, convenience inside and outside, cost lower than smartphone, MP3 player or ipad. 5, Just turn on the radio and adjust channel, then you can enjoying news and music. 6, no LED, no screen to consume power, power by 2*AA battery, support long battery life. Product dimension: 4.53" x 2.56" x 0.98"
The am fm radio built-in HD speaker for clear, soft sound. Match stereo 3.5mm earphone jack for music, talk shows, give you feeling of immersive. Good reception: Designed with 14inch extendable antenna, good selectivity make it work stable without any interference. Stable signal, multi-channel, listen to what you want. Easy Tuning: There are no technology problems, tune in to your favorite channel just 3 steps. warm gift for your kids, parents, grandparents, aunts or uncles, it's sure to fill their heart with joy. Lasting Long Time: The portable radio runs on 2*AA battery. Accompany you to hiking, travel, garden or where you want to go. Warranty: Order it now and get 18 months warranty. Enjoy the freedom of listening to your favorite AM or FM station without having to carry a handheld radio! 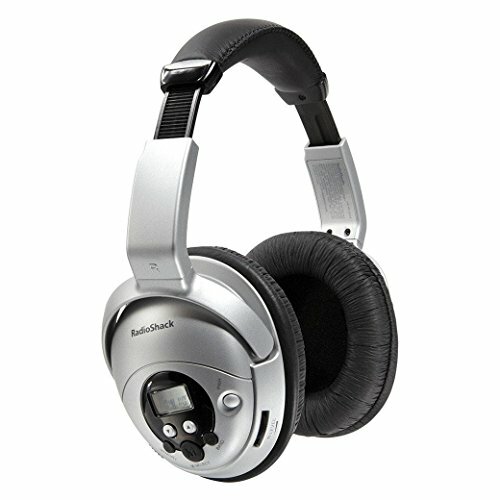 It's ideal for listening while you move around and still hear clearly without having to blast your stereo. Controls conveniently located on earcups. Built-in antenna. Stores up to 10 AM and 10 FM stations in memory. Digital LCD display with low battery indicator. 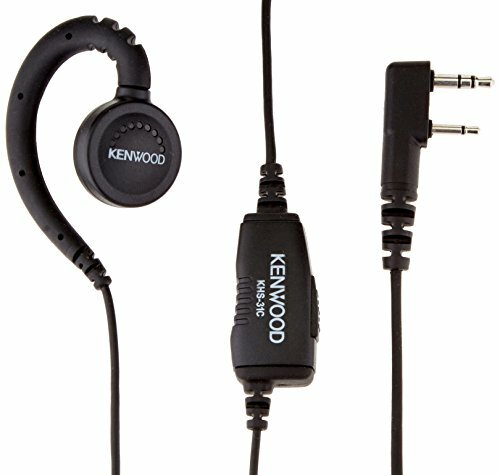 Included stereo 3.5mm (1/8") input jack allows the use of this headset with your portable media player or other audio devices. The headset includes low battery alert and requires two AAA batteries (not included). One pair of batteries gives up to 42 hours of operation. FM Gain : 30 dB Min. Included stereo 3.5mm (1/8) input jack allows the use of this headset with your portable media player or other audio devices. Enhanced bass and independent volume control for Left and Right ear cup. Comes with a built in antenna to enhance signal strength, while the extended bass function enriches deep tones. Frequency range: AM 520-1720kHz, FM 88-108MHz. Uses 2x AAA battery for operation (battery not included). 1.When you use it,Please insert the earphone as fm antenna to search radio station. 2.For the first time to use,please charge the battery for more than 4 hours, ensure the battery is fully charged. 3.In the United States,Canada and other North American and South American countries must set to 10 KHz,other countries must set to 9 KHz. If you have any question, please contact us ,we are here to help. 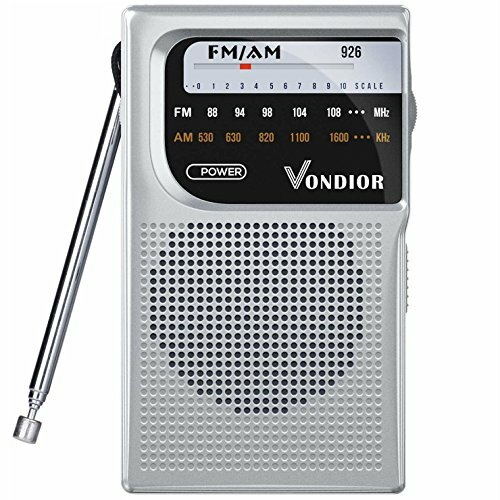 High Quality AM FM Radio - The portable radio supports AM and FM broadcasts. FM: 64-108MHz; AM: 520/522-1710KHz; High sensitivity and selectivity with excellent reception. You can start to Scan from 3 Nodes: FM1 - 64MHz, FM2 - 87MHz, AM3 - 520/522KHz. Light Weight & Portable - Small Size super light weight of 0.1 lb is portable and can be easily slip into any pocket, handbag or glove compartment. Use it for jogging, walking around neighborhood, taking the dog for walk, doing sports at the gym, or traveling. Easy To Use - Automatic search and store the radio station. Only designed with several simple buttons. Built-in 500 mAh battery for better battery lifetime and working time. Ideal as a Christmas gift, Birthday gift for seniors and kids. Meet All You Need - Package include : 1 x Portable Radio, 1 x Earphone, 1 x USB charging cable, 1 x English manual. If you have any question, please contact us, we are here to help. 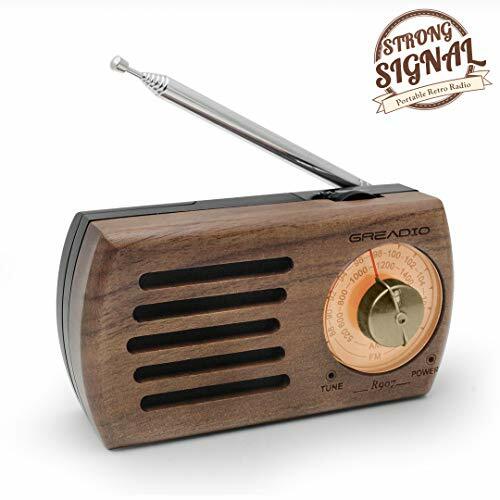 Retro Design Radio One-side handcraft natural walnut wood FM/WB retro radios, it features wireless bluetooth speaker, clear and crisp speaker, 7 NOAA channels, 2200mAh battery for up to 8 hours of playtime. Wireless Bluetooth Speaker Enjoy your relaxing time with retro radios through easily and conveniently connect iphone, android, laptop and any device with retro bluetooth speaker. Good Clear Sound The retro speaker with excellent clear and crisp sound fills your room to meet your high demand of speaker quality, perfect for home, dorm room, kitchen, bathroom, car, parties, travel etc. 7 NOAA Weather Channels The unique function compared with other retro weather radio is always getting latest weather and all hazards information in your area. Guarantee & Warranty We offer 30-day money back guarantee, 12-month replacement warranty and lifetime technical support. The wulnart wooden radio speaker can be as a perfect decoration or artwork when you place it on desk and shelf or anywhere you want. 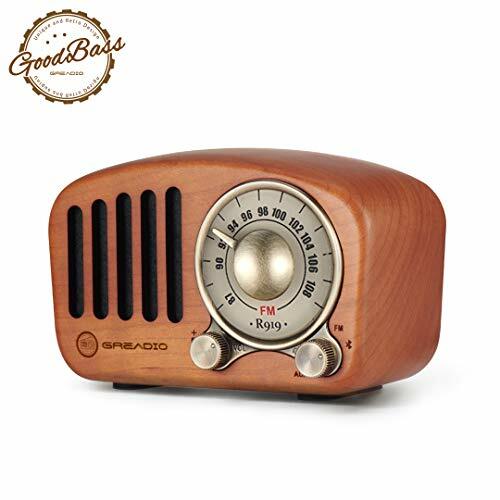 Stylish and retro style matched with that pretty warm colored of the old style radio speaker,it goes seamlessly with all the hardwood furniture around your house. comes with MP3 Player and TF Card to play music to connect the box directly to your device,in case you do not want to pair it with Bluetooth. This unique vintage Bluetooth speaker is equipped with a bass enhancement system in the front, so it sounds more vast than other speakers of similar size. The retro speaker is built with two pieces of 3-watt amplifiers for processing audio output, you will be addicted to the stereo rich sound. a physical rotating dial for channel scanning, which takes you back to 1950s! yard work,garage,campfire,hiking,biking or beach,whatever you need it to do. 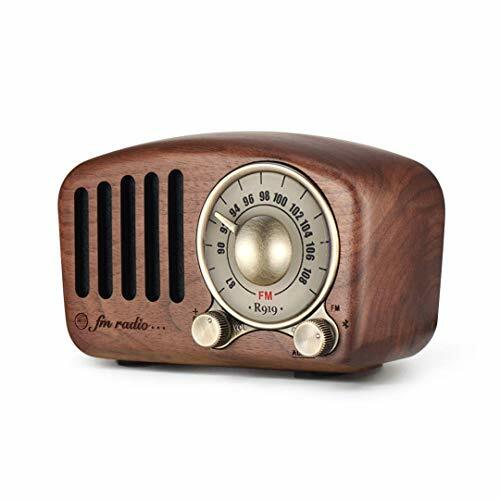 Let's Go Back To the Old Time This vintage radio speaker was crafted by natural walnut wood and blends modern technology with retro classic aesthetics, combines the latest and best digital audio tech with a 1950s retro vibe. We can feel like back into the golden age of music in 1950s, enjoying a soothing moment in today's busy life. With the advanced Bluetooth 4.2 technology, this retro bluetooth speaker could be connected with your smart equipment in less than one second. Develop You Own Fashion Style The specially designed retro bluetooth speaker differentiates you from common music lovers with it's unique vintage appearance. This retro radio wireless bluetooth speaker has a nostalgic appearance that was given a fashion & modern meaning.The retro FM radio function instantly takes you back to the good old days of radio channel surfing. Just enjoy the Hillbilly Cat and the Beatles music with this vintage radio bluetooth speaker! Ideal Gift For Music Lover This unique retro bluetooth speaker is equipped with a bass enhancement system which let thevintage radio produce from the front. So you could enjoy a stereo rich sound without any complicated or heavy traditional speakers. Anyone that loves music will love this retro radio speaker. You will always be remembered with this special and impressive gift! Reliable Quality Plus Risk-Free Guarantee The latest sound production technology, unique design and top-quality standard for retro radio mark this vintage radio as an distinctive choice for both leisure and formal occasions! You can use it anytime anywhere. Plus, a 1-year MONEY BACK WARRANTY and lifetime customer service make it no risk for you (exclude wear and tear). Just enjoy your life this most innovative retro bluetooth speaker! SURPRISINGLY LOUD VOLUME - 5 watts of power with custom Mifine solo neodymium driver delivers full range sound. Proprietary Passive Bass Radiator Design delivers surprising Bass output from such a compact design. Enjoy strong, rich bass without distortion, even at the highest volume. VINTAGE RADIO PORTABLE - 100% natural walnut wooden hand crafted exterior. Its warm colored and vintage appreance, which matches seamlessly with the texture of your wood furniture around your house. Lightweight robust unibody and unique sophisticated design maximizes portability. Toss or hang it in your hiking backpack, throw on your bike or just grab it and go, ideal outdoor speakers for the parties, dorm room, park, yard, car, relaxing at home or anywhere else imaginable. 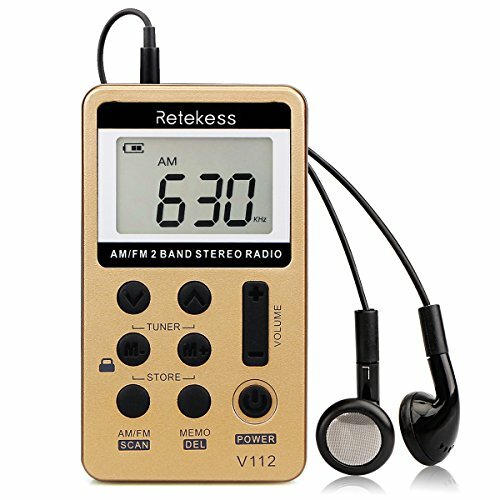 AM/FM RADIO This portable radio is a 2 band radio enabling you to choose AM or FM to listen news, sport and music. Equiped with a long antenna, you are no longer worry about the reception problem and just freely enjoy your radio time. 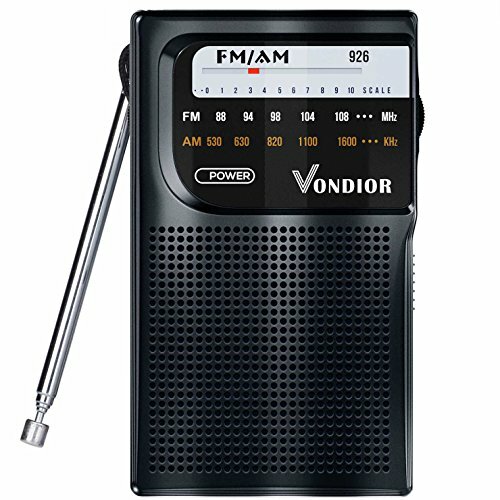 As this is a battery operated radio (battery not include), you still can keep in touch with outside information by using this am fm radio even in power outage. SPECIAL RETRO DESIGN Combined with vintage concept, the front side of this pocket radio is made by natural walnut wood and the tunning knob of this portable radio is also in accord with this concept making it looks retro and special than other transistor radios. It will make you feel back to the old days while you are listening this am fm radio. 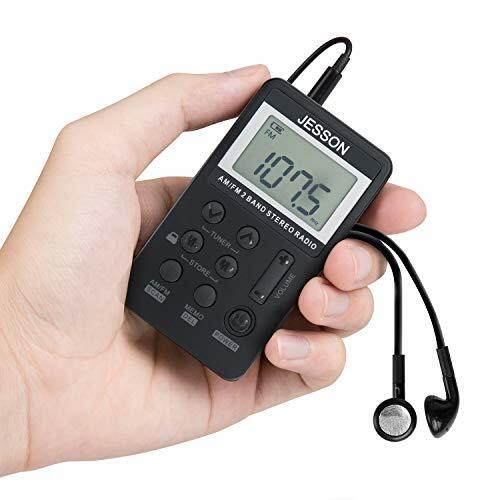 POCKET SIZE You can put this portable radio to your coat or pants pocket as its size is 4.7*2.5*1.3 inches, very suitable for you to take it outside like walking, jogging and travelling. Not only that, this battery radio's weight is 0.29lb, which will not be your burdon on your outdoor activitives. USER FRIENDLY The operation of this am fm radio is simple. No too much buttoms, it just volume knob, tuning knob and OFF/AM/FM switch.The frequency scale indication is designed clear for you to see and the tuning knob is big and easy for you to switch. Besides, not like other transistor radios that need you to hold, this battery radio can stand steadily on the table freeing your hand. HEADPHONE JACK If you are annoyed at the noisy environment when you listen the pocket radio, you can plug your earphone to the headphone jack to focus on the radio time. And we guarranty a 12-month warranty, 30-day money back and lifetime customer service to make it no risk for you to purchase this battery operated radio. BQYPOWER Digital AM / FM Pocket Radio -- Enjoy The Best Radio! 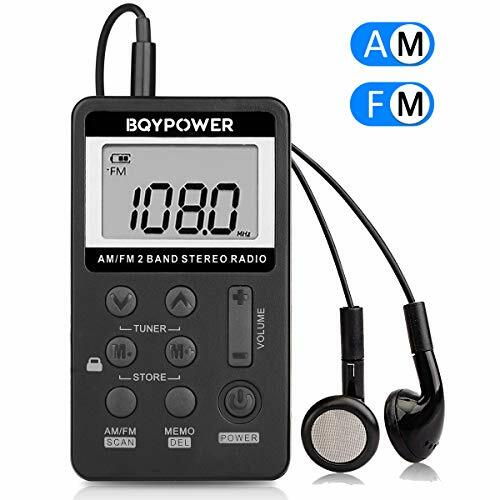 Why Not Try Our BQYPOWER New Version of Portable Digital AM / FM Pocket Radio? It Is With Much Better Reception, Wider FM Frequency Range And More New Functions,Which Will Definetely Take You A Womderful And Relaxed Experience! Pocket Size radio is easy to carry with you anywhere you go. Built-in 500mAh rechargeable battery can easily meet your daily need. Designed with several simple buttons that are easy to operate and control. It is also suitable for seniors and children. 1. When you use it, please insert the earphone as fm antenna to search radio station. 2. For the first time to use, please charge the battery for more than 4 hours, ensure the battery is fully charged. 3. In the United States, Canada and other North American and South American countries must set to 10 KHz, other countries must set to 9 KHz. Super Light Weight and Portable -- Small Size: 1.85 x 3.17 x 0.4 inch and super light weight of 0.1 lb is portable and can be easily slip into any pocket, handbag or glove compartment. Use it for jogging, walking around neighborhood, taking the dog for walk, doing sports at the gym, or traveling. It's also an ideal gift for your family and friends. Easy To Use -- Automatic search and store the radio station, Only designed with Few simple buttons to easy operate for anyone.This AM FM Pocket Radio with lock key function which ensures you to listen to your favorite stations without any accidental operation in your pocket. 500MAH Li-ion Rechargeable Battery -- No need to change batteries frequently, 500mAh rechargeable Li-ion battery could meet for your daily need. 15 hours play time after fully charged. High Quality Reception AM/FM Radio -- FM: 64-108MHz; AM: 520/522-1710KHz; 9/10KHz. Earphone is also used as fm antenna, High sensitivity and selectivity with excellent reception allows you to enjoy music, morning talk shows, sports games etc in anytime, anywhere.With LCD screen,you can read the radio station directly and know the charging process. Short press AM/FM to switch frequency band, long press AM/FM and it will automaticly search and store available station,It support store 58 radio. WHAT YOU GET FROM US -- Not only muliti-function Walkman Radio with 3.5mm earphones, lanyard, and a usb cable you get but also 12 month no-pressure product exchange and money back guarantee. If there are any problem or misunderstanding, please feel free to contact at anytime,we will be always here to assist you. WHAT YOU GET FROM US -- Not only muliti-function AM/FM Walkman Radio with 3.5mm earphones, lanyard, and a usb cable you get but also 12 month no-pressure product exchange and money back guarantee. If there are any problem or misunderstanding, please feel free to contact at anytime,we will be always here to assist you. Looking for a hands-free expansion to your ProTalk radio? 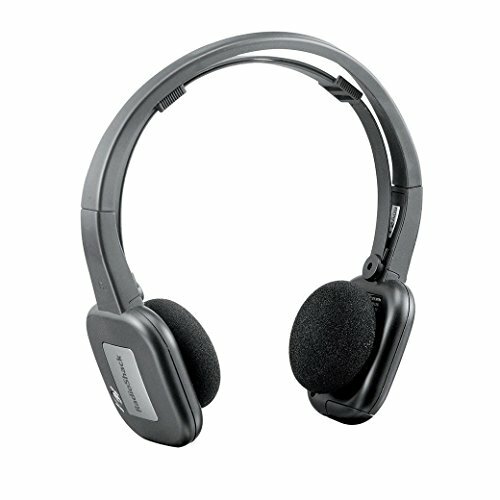 Look no further than the KENWOOD C-Ring In-Line Push-To-Talk Headset! This C-ring ear hanger fits snugly around the ear and allows hands-free use for all KENWOOD ProTalk radios except the PKT23. 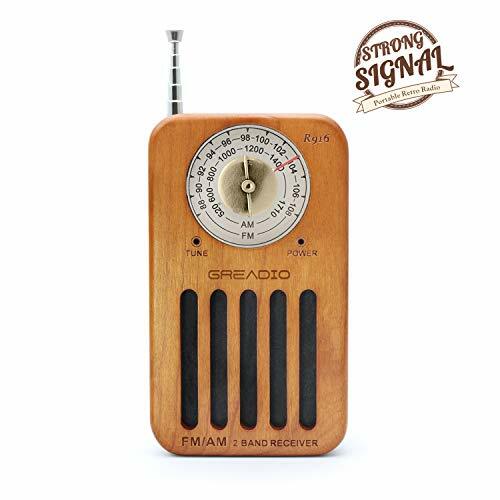 Greadio am fm portable radio brings you back to old days without super-complicated technology. Enjoy the simple life with your family and friends. Do not look down upon its mini size, this portable pocket radio has strong reception and long antenna that you can clearly search FM and AM. 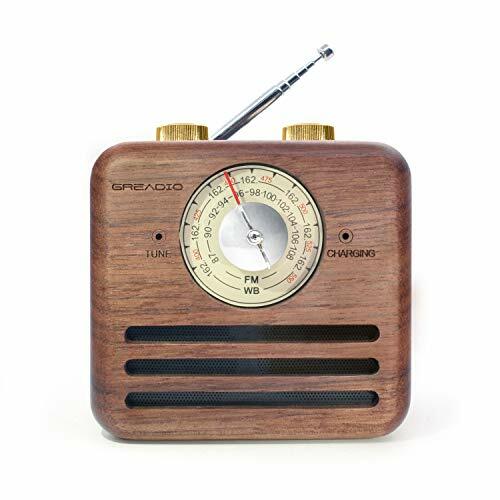 The front side of this portable am fm radio is made of cherry wood. It makes you feel backing to old times while you are listening this pocket retro radio. Not only the frequency scale indication of this am fm battery radio is clear for you to see, but also the tuning knob is big and easy to switch. No more complicated operation, this portable pocket radio is user friendly that you can use it happily. Even in noisy place, you can keep focus to listen this pocket retro radio with earphone. Just plug your earphone to the headphone jack that you can enjoy the radio time. The size of this am fm battery radio is 4.9*2.7*1.5 in, it is compact and portable. 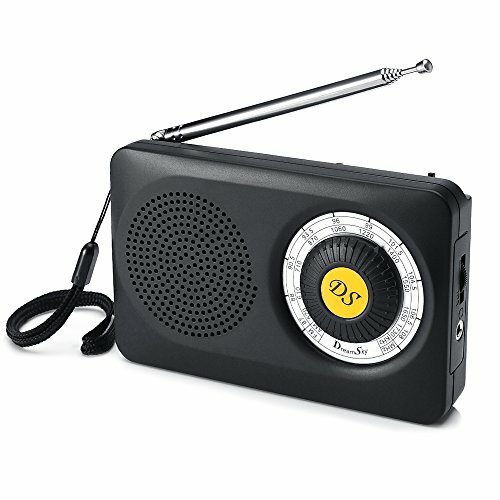 Not take you too much space, you can put this portable retro radio in your coat or pants pocket when you go outside. No need to hold this pocket portable radio with your hands, it can stand very steadily that you will not afraid it slid down. You can place this battery am fm radio to your kitchen or bedroom to play. This portable pocket radio is suitable for you to take to anywhere like walking, jogging and travelling; your good partner for outdoor activitives. 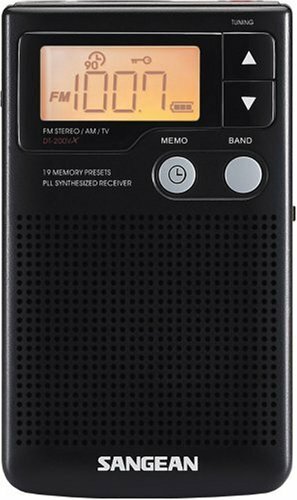 As the elderly could not get into high technology quickly, this portable am fm radio is good for them to keep in touch with outside world; for the children, they can listen this pocket retro radio to study instead of immersing themselves in electronics. Just a simple operation, they can easily get the information they want. HEADPHONE JACK This pocket radio equips a headphone jack for you so that you can focus to listen news, music or sport with ear phone even in a noisy environment. Moreover, we guarranty a 12-month warranty, 30-day money back and lifetime customer service to make it no risk for you to purchase this transistor radio. 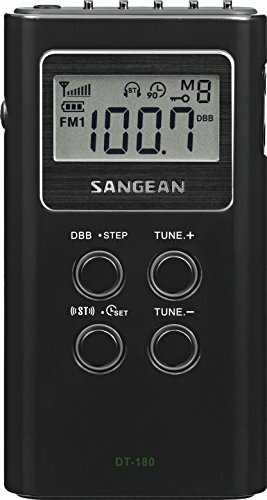 With Phase Loop Lock Digital Tuning and Sangean's traditional radio sensitivity you will be able to enjoy your next day trip, your short trip to the beach, or other outing without missing your favorite AM/FM station if you have the SR-35 pocket radio. 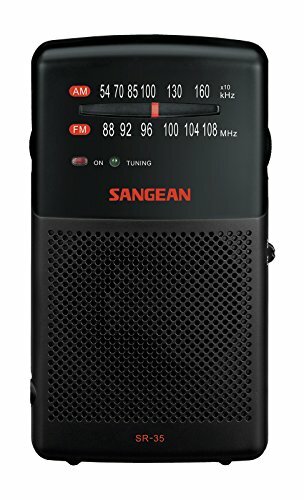 The Sangean SR-35 AM/FM analog radio is an attractively styled pocket sized radio with simplicity and function in mind that offers a combination of features for enjoyable AM/FM listening. In true Sangean tradition AM/FM reception is excellent providing clear and static free listening and the rotary Tuning dial precisely tunes your station selection displayed in a softly lighted analog display. It has excellent Audio for its size. Carrying strap included.